On Saturday, April 22 from 9 am to noon, roll up your sleeves to clean trash and invasive plants. Bring your family and friends! 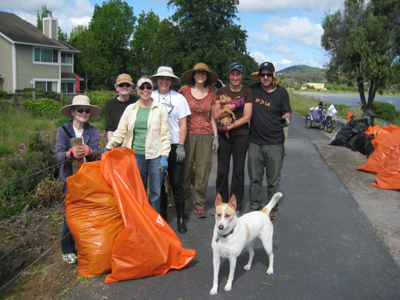 This year we will be at four locations focusing on the San Rafael Canal and Jean and John Starkweather Shoreline Path. After volunteering, enjoy a free family event: Living Oceans Earth Day for Children at the Falkirk Cultural Center. Or, on Sunday, April 23 from 11am to 1:30pm, join the Gallinas Watershed Council to pick up trash at Gallinas Creek via kayak!